ALBUM REVIEW: SULTANS OF STRING, "Subcontinental Drift"
Now this is really something – since forming eight years ago, Sultans of String’s music has hit #1 on national radio charts in their native Canada, and have received multiple awards and accolades, including two JUNO nominations, 1st place in the ISC (out of 15,000 entries) and two Canadian Folk Music Awards while head honcho Chris McKhool was awarded a Queen’s Diamond Jubilee Medal for his work in creating community through music. Over the years, this group has shared stages and recording studios with renowned guests like Paddy Moloney and The Chieftains, David Bromberg, Alex Cuba, and Ken Whiteley with other collaborations yet to be announced. 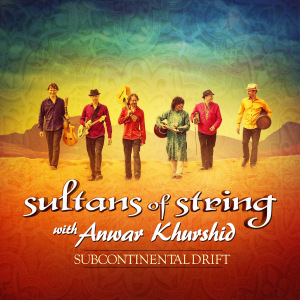 On their new release, Subcontinental Drift, Sultans of String serve up a blend of ragas, reels and rumbas. Fiery violin dances with rumba-flamenco guitar, atop unstoppable grooves laid down by bass and percussion and some very powerfully moving vocals. Acoustic textures with electronic embellishments, which create deep layers of sound. Throughout this album, they are quite ably aided by featured guest sitar master Anwar Khurshid (whose music appeared in the Oscar winning films Life of Pi, Kama Sutra, and The Love Guru). As per some of the standout tracks is the melding of an ancient Irish fiddle tune called “Rakes of Mallow”. As history would have it, the song made its way to England when the British were ruling India – English and Indian musicians learned from each other musically and in India it became known as “Band Sargham”. Here, the band and Anwar Khurshid bring the two interpretations of the tune together in stunning fashion. On “Enter The Gate”, the opening piece, you’re immediately enveloped by the loveliness and hypnotic nature of the Indian melody suddenly being intertwined with the Celtic fiddle and the rhythm and tempo kicking up; the title cut, “Subcontinental Drift” has a very warm acoustic guitar finger-picked figure that draws in the sitar and is delicate as it’s mournful. Of course, I would be remiss to not give a nod to the very interesting and different take on Dylan’s “Blowin’ In The Wind” – uplifting and inventive. Something for everyone in this album – and something very special here. Subcontinental Drift has hit a moment that doesn’t need to be over-analyzed; it only needs to be listened to and experienced.